Members of SPJ DePaul's executive board pose with awards from Good Day DePaul and The Red Line Project. 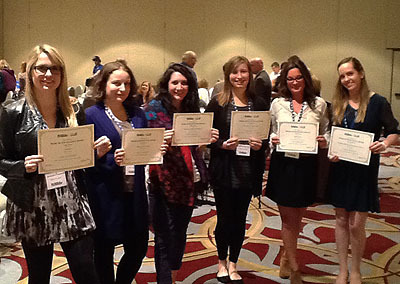 DePaul University journalism students won 19 awards — including six first-place finishes — at the SPJ Region 5 Mark of Excellence Awards April 14 in Indianapolis. The six winners advance to the national Mark of Excellence Awards to compete with 11 other regions. Those winners will be announced in late September. Region 5 covers universities and colleges in Illinois, Indiana and Kentucky.